The general strike packet that the education committee of the South Central Federation of Labor distributed to its affliate unions in Wisconsin. 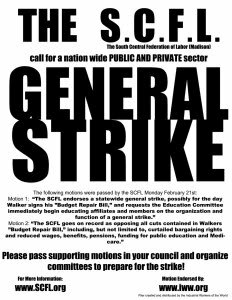 Motion 1: The SCFL endorses a general strike, possibly for the day Walker signs his budget repair bill. Motion 2: The SCFL goes on record as opposing all provisions contained in Walker’s budget repair bill, including but not limited to, curtailed bargaining rights and reduced wages, benefits, pensions, funding for public education, changes to medical assistance programs, and politicization of state government agencies. Since then, Larry Cohen, International President of the Communications Workers of America, has called for a “not-business-as-usual” nationwide Day of Action on April 4, the anniversary of the assassination of Martin Luther King, Jr. I have received no written confirmation, but have been told that the AFL-CIO Executive Council supports this call. To follow up on the SCFL motions, we created an ad hoc education committee. The enclosed materials (described below) were prepared by/for this committee, and these materials, as well as a representative from this committee, can be made available for any of your local’s meetings. As the labor movement moves to address this naked class war waged upon us, we know we have already accomplished much, setting an example to the nation and the world for how to fight for our rights and for our children’s futures. It appears we have much more to do.